Painting 40 x 61 cm (16″ x 24″), oils on canvas board, available, £1,200, ex studio, ex frame. Tectona has a new future working as a sail training project for people with mental health and drug miss-use problems, all based in Plymouth. Thanks in part to this painting and web site I was able to bring together people interested in Tectona; result! 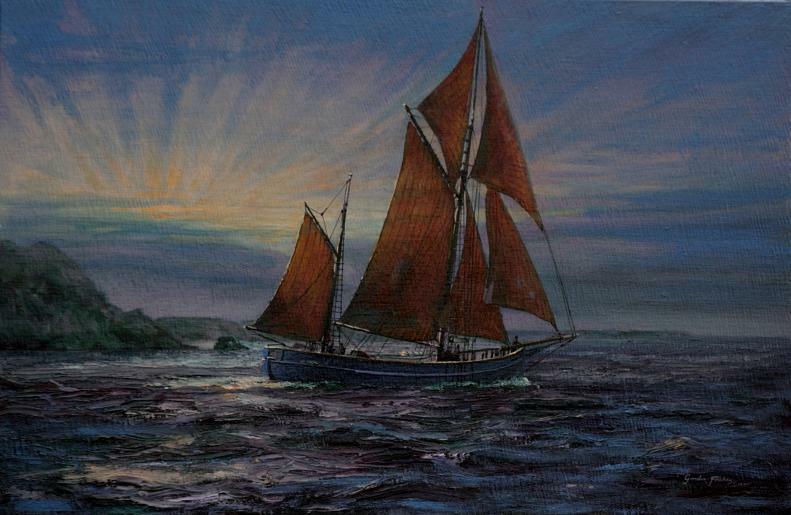 I am delighted to have played a small but significant part in the story of Tectona the ketch. 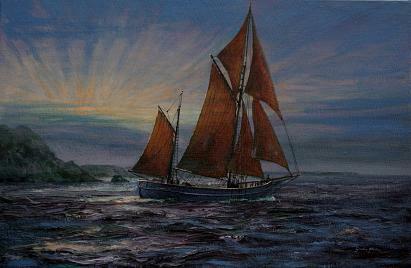 It was believed Tectona was lost, after a long and useful life. This sturdy 80 ton ketch served as a training vessel with “ Moyana ” for cadets of the School of Maritime Studies Plymouth Polytechnic (now Plymouth University) between 1964 and 1980. Built in Calicut India in 1929, to a Colin Archer design the Tectona was found at Port Napoleon in poor condition, overhauled then sailed to Tom’s Yard Polruan Cornwall for a major re fit so saved from obscurity.